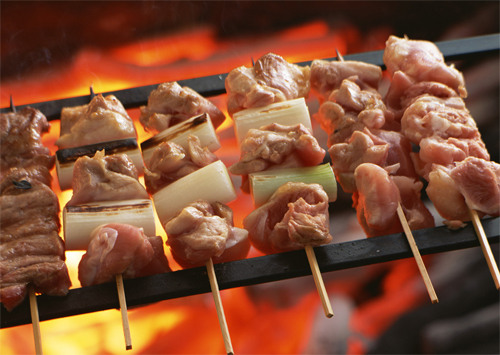 In recent years, Japanese yakitori or grilled chicken has become known to people overseas. 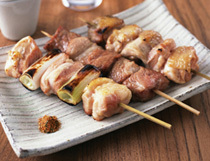 Yakitori refers to a variety of grilled chicken meats and parts on skewers. 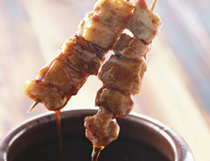 In general, yakitori is seasoned with sweet and salty shoyu-based tare (sauce) or simply with shio (salt). In Japan, many yakitori shops specialize in this tasty snack, while most izakaya (Japanese style pubs) also list yakitori on their menu. At the yakitori specialty restaurants, customers can enjoy food while watching the chicken being grilled over charcoal in front of them. Types of yakitori restaurants vary, from high-end to casual ones. Yakitori shops is are also a popular destination for Japanese salarymen (businessmen) to go for after-work drinks. When you order yakitori, you will be asked your choice of seasoning; tare (sauce) or shio (salt). It is said some parts of meat taste better with a certain seasoning. If you are not sure what to order, ask your server for advice and recommendation. You may spice up your yakitori with ichimi togarashi (single flavor hot pepper), shichimi togarashi (seven-flavor hot pepper), or sansho (Japanese pepper). In addition to seasoning variations, you will enjoy different flavors and textures that each part of meat offers. Favorite chicken parts among Japanese people include momo (thigh), kawa (skin), nankotsu (cartilage), teba (wing), sunagimo (gizzard), hatsu (heart),and tsukune (chicken meat ball). If you are ordering a plate of assorted yakitori but do not care for inner parts, ask your server to exclude naizo (inner parts), such as sunagimo and hatsu. Since Buddhism was introduced to Japan, eating meat had long been considered a custom from which to refrain. Especially, it was unthinkable to eat domestic animals such as cattle and pigs for they were an important workforce for farming. Instead of chicken, which was also part of farm animals, people hunted wild birds such as pheasant and duck to eat. According to historical records, the word “yakitori” was first used during the Edo period. 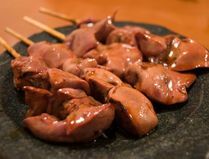 It was a part of a dinner course presented to the lord of Komoro Castle (in today’s Nagano Prefecture) and is believed to have been a grilled wild bird. Eating meat gradually became known to people as new customs from Europe were introduced to Japan as part of the Meiji Restoration. Chicken also began to be eaten but only as an exclusive dish served at restaurants. 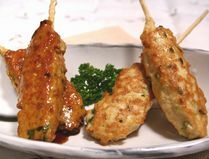 For common people, unused parts of chicken meat from restaurants, such as gara (bones) and suji (tendon), were grilled on skewers and were sold at street stalls, which became the origin of today’s yakitori. This new snack was commonly sold at stalls along the paths to shrines, near bridges, and at festivals, and gained popularity for its convenient serving style of being on the skewer that is portable and requires no chopsticks. Yakitori has been loved as a reasonable gourmet snack for common people since its birth. Eating yakitori directly from skewers is still considered a common manner today, although some people, especially women, eat them after taking meat pieces off from the skewers while dining at pubs and restaurants.